Take enough time to focus on each shot before making it. 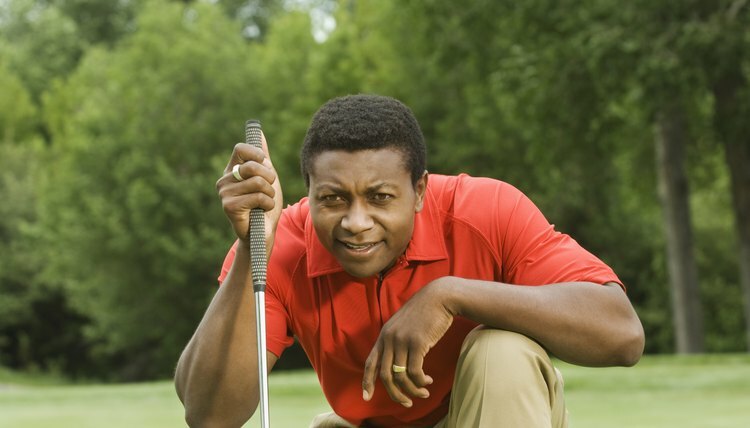 A golfer with an impressive set of physical skills who cannot focus adequately during a round might struggle as much as an average golfer with high focus. Although many other sports require athletes to make split-second decisions, golf is a slow-paced game that requires careful planning and focus before making every shot. Fundamentals are vitally important in golf, but so too is being mentally strong enough to block out distractions while you are playing. Begin every hole as though it's the first hole in the round. Doing so is obviously easy on the first hole, but try to achieve this free feeling on subsequent holes. It's common for golfers to struggle with a tee shot on a hole after posting a poor score on the previous hole. Have a short memory; put bad holes out of your mind as soon as you step off the green. Block out all distractions when you step up to make your shot. Think of nothing but the ball and how you are going to hit it. Golf courses can be full of distractions such as birds chirping, other players talking and golf carts driving past. Practice being in a mental zone in which nothing exists but you and the ball. Set small goals for each round of golf that are achievable and realistic. Many golfers get dismayed by a poor score on an early hole and consider their round ruined. If you break the course up into six groups of three holes, a bad score on any given hole only hurts that three-hole group. For example, if your goal is to shoot 3 over par on the first three holes and you manage 2 strokes over par, you've exceeded this initial goal. Develop a standard pre-shot routine that calms you and narrows your focus when standing over the ball. Professional players are often obsessive about their routines; if the crowd makes a noise during a player's routine, he'll step away from the ball and start the routine over again. If you focus on going through the routine, you'll be less apt to get distracted by the factors around you or over think the situation. Clear your mind after hitting each shot and enjoy the walk to your ball. It can be easy to obsess over the ball's lie, how you'll approach the shot and what you might score, but thinking of these factors is useless until you are standing over the ball. When you get there, analyze the situation, determine how to approach the shot and begin your pre-shot routine.